An FME author (don&apos;t worry, this time it wasn&apos;t you) created a project to map roads in the downtown area. However, the author knew very little about FME and broke a lot of basic design rules. You&apos;ve been asked to make some edits to the project but it&apos;s a very difficult workspace to understand and you find that you first need to make some improvements in the methodologies used. Examine what the workspace does. You&apos;ll see there are two main processing streams. In the first, a number of raster files are being read and a test carried out to filter those that are not needed. The raster data is then mosaicked together. The second stream starts with a set of roads data. The data is buffered (to enhance its appearance), a color is set, and it is written onto the raster data backdrop (using a VectorOnRasterOverlayer transformer). Run the workspace and examine the result. The output is fine - but the design of the workspace is not very good at all. Looking at the raster feature types, it is obvious that much of the data being read is being filtered out by the Tester. Use summary annotation on the Tester. 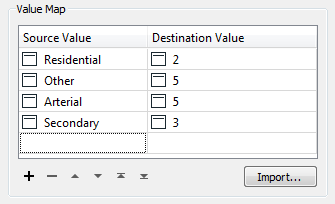 This will show the Tester parameters without you having to keep opening and closing the parameters dialog. Check which files the Tester is keeping. Remove any Reader feature types that are not part of the list. Then remove the Tester itself. 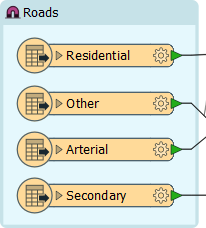 Looking at the road feature types, some of those are not even connected. They can be deleted immediately. The workspace might now fit the canvas at a reasonable scale! 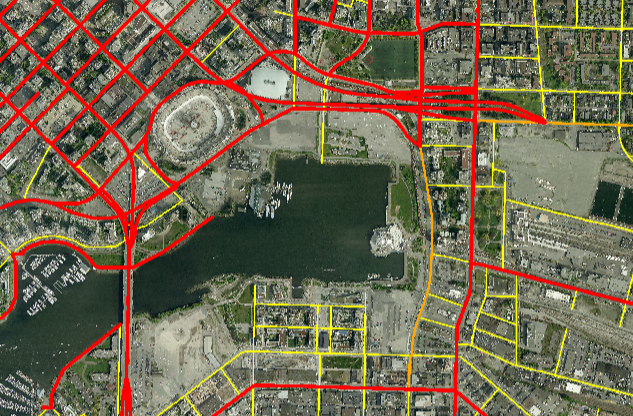 One obvious oddity in the workspace is that the Secondary and Residential roads are given a color with the FeatureColorSetter transformer, but the Arterial and Other roads are not. Perhaps the workspace author thought the existing red color was already suitable. This might be true, but there&apos;s no guarantee the source data might not change, or contain errors in color. We should ensure that these features appear red, regardless of what the source data says. I think this workspace is going to be fine, but in other scenarios I might be concerned about the RasterMosaicker and the VectorOnRasterOverlayer transformers. 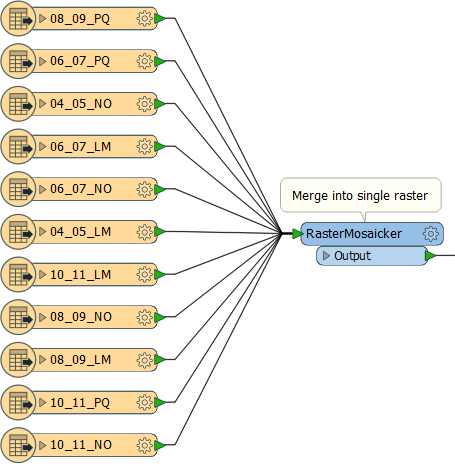 For example, how do I know that only valid raster features will reach the RasterMosaicker transformer? What might happen if a rogue vector feature reached that transformer? A simple GeometryFilter transformer can help me filter out features with unexpected geometry before they can cause a problem, but it is these sort of questions you need to ask in order to fully error-trap a workspace. 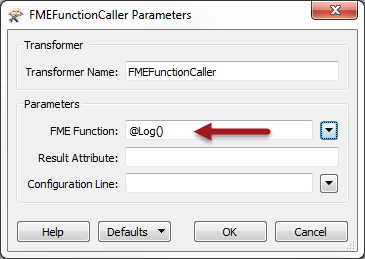 You may have noticed the FMEFunctionCaller transformer lurking towards the end of the translation. This transformer is able to make calls directly into the heart of the FME engine. However, it&apos;s not often that you would need to do such a thing. The transformer seems to be doing a very simple call to log the current feature to the log window. 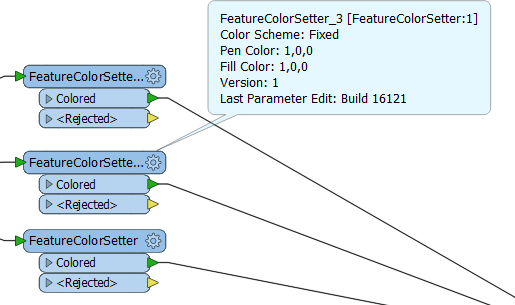 Besides the fact that it&apos;s probably for debugging, there&apos;s no need to use an FME function to do such a thing. The Logger transformer works just as well, and has more options available. If you get a message pop-up (or appear in the log window) about features not matching, don&apos;t worry. It isn&apos;t an error message and won&apos;t stop the workspace from functioning. You&apos;ll find out more about this message in another chapter of training. Basically, by doing this, we have reduced the number of transformers required in the workspace. In this case, we only saved a single transformer. However, if future edits required other road types to be included, we could use the same infrastructure and not need to add more transformers. Similarly, future changes to the buffer amounts can be set through a single transformer, not a series of them. In all, this part of the exercise has made this workspace very scalable.